If you’re in need of a professional fishing guide here on the Kenai Peninsula, we’ve got you covered. Learn why everyone is coming to the Kenai Peninsula to fish for the famous Kenai River King, and find out about the area. Find out whats happening on the Kenai River, Kasilof River and other fishing locations from a professional Kenai River fishing guide. Sign up for updates on fishing and offers! A typical King in the first run, beginning in early-june, weighs 40 pounds. 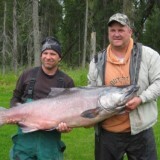 The “Lower Kenai” is well known for its run and sizes of its king salmon. The red salmon runs are towards the end of June and late-July. Red salmon are considered the premier salmon for eating, canning, and smoking. A typical King in the second run, beginning in mid-July, weighs 40 pounds. 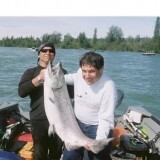 The “Lower Kenai” is well known for its run and sizes of its king salmon. The silver salmon runs starts in early August and continues till sometime in october. I am a Lifetime Alaskan, born in Soldotna Alaska. I have fished the Kenai River and other local Alaska waters my entire life. We have top of the line boats and equipment, and First Class service. Our rates are very competitive. We offer Full Day and 1/2 Day Kenai River Fishing charters. We offer fishing trips for a variety of salmon, trout on the Kenai River and the Kasilof River in Alaska. Rainbow Trout is one of my favorite trips that I offer as a fishing guide. The Kenai River has world class trout fishing and each fall the fishing lives up to its reputation as one of the best Rainbow Trout fisheries in the world. At Jim Rusk Fishing we use top quality, proven fishing equipment. Fishing the Kenai River and the Kasilof River demands the use of High Quality Boats. We spare no expense to ensure you fish and with the very best! We use Willie Boats. They are hand crafted fishing machines. We can customize a Guided Fishing Trip just for you. We can also help you get the lodging that best meets the needs of you and your party. Customer service is our number one priority when we guide anglers that visit the Kenai peninsula. We do whatever it takes to make sure you will have the best experience possible while fishing with us. If you are not catching fish, not much else matters. With Jim Rusk Fishing Kenai Fishing Guide you are guaranteed fishing with only the best guides that have years and years of experience. I encourage anyone coming to Alaska Kenai Peninsula to please check references on whomever you choose to go with. We have an extensive repeat clientele and can provide customer names and phone numbers from all over the country. The Kenai is a glacier fed river that has been undergoing a cycle of water level changes for millions of years. It’s a river that drains the glaciers of the central Kenai Peninsula region. Drift Boat fishing in a big Willie boat is a must-do on a fishing trip to Alaska. Anglers come to the Kenai Peninsula to catch big King Salmon and big Silver Salmon. The Kenai River is the most popular sport fishing destination in Alaska, particularly for King salmon, also known as Chinook salmon. Each year we have two runs each of King Salmon, Silver Salmon, red salmon, plus a run of pink salmon every second year. Occasionally there will be reports of catches of Steelhead Trout. The Kenai peninsula, home to the famous Kenai River and Kasilof River, has as much Alaska wildlife as any region of Alaska. And Alaska is famous for its abundance of wild life . While fishing we have seen moose, bear, eagles, beavers, cranes, ducks and every wild creature of Alaska. The two rivers are most famous for salmon and trout fishing ,but you can encounter many types of wildlife while fishing and visiting this wonderful region of Alaska. Before September of 2012, fishing in Alaska had been a dream of mine. I finally scheduled a trip to Alaska, found Jim on the internet, and we scheduled a week in September to fish for silvers. Jim was the first guide to return my call and I’m glad he was! I fished with Jim for a week on both the Kenai and Kasilof Rivers and Jim always worked hard to put us on the fish. He was a great guide with an intimate knowledge of both the kenai and the kasilof rivers and had great relationships with the other local guides which was very helpful. Despite unusually slow fishing conditions – and this was the general consensus among the guides and locals – we caught our limit every day but one and did so when other guides could not. Jim was friendly, courteous, very professional and respectful, and best of all he clearly took his guiding work very seriously. When many others were not catching fish, we were! I highly recommend Jim Rusk for your Alaskan fishing adventure!! I’ve fished with Jim for 16 years and he has consistently been a top guide and catches fish even with little action around. He was born and raised on the Kenai and knows every hole and trick of the trade. 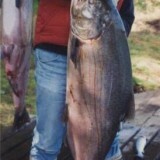 The 19.75 lb Silver in the pictures below is just one of many trophy size Salmon and Trout from over the years. Besides the fishing, Jim is friendly, works hard to make you happy and really wants everyone to be part of his fishing family. I have brought tons of guests over the years and everyone goes home happy after fishing for a week on the Kenai and Kasilof with Jim. Before September of 2012, fishing in Alaska had been a dream of mine. I finally scheduled a trip to Alaska, found Jim on the internet, and we scheduled a week in September to fish for silvers. Jim was the first guide to return my call and I’m glad he was! I fished with Jim for a week on both the Kenai and Kasilof Rivers and Jim always worked hard to put us on the fish. He was a great guide with an intimate knowledge of the rivers and had great relationships with the other local guides which was very helpful. Despite unusually slow fishing conditions – and this was the general consensus among the guides and locals – we caught our limit every day but one and did so when other guides could not. Jim was friendly, courteous, very professional and respectful, and best of all he clearly took his guiding work very seriously. When many others were not catching fish, we were! I highly recommend Jim Rusk for your Alaskan fishing adventure!! I have had the opportunity to fish with Jim on two different 5 days trips. Jim has lived in the area his entire life and it definitely shows! At the end of the day, our boat was always one of the top boats if not the top boat of the day in regards to numbers. Jim doesn’t just take you fishing, he makes certain that he puts you on fish which I truly appreciate! I highly recommend setting up your next fishing trip with this highly competent guide!!!! I can’t wait to be back on the water with Jim!!!! We caught lots of big silver salmon and Lake trout. We had a wonderful time cruising the Kenai Reiver with this Alaskan born Kenai fishing guide. Jim did all the hard work and we just had to cast. He KNOWS where the fish are pasing.